The Taiga is the largest and most expansive area of terrain in the world, translating roughly to ‘snow forest’ the taiga stretches across most of northern Canada and large parts of eastern Russia and into Siberia. The King of this wilderness is obviously not the lion, but the grizzly bear; used to harsh conditions and rough terrain, join the bear in a slots online game that sees you spin the reels on a damp forest floor filled with moss and a range of symbols including nuts and berries that have been foraged along with wolves, bears, and shrews. Combining the endearing, classic qualities of traditional slot machines, with the digital innovation and enhanced playability of modern online slots, Playson have dozens of dynamic titles on the market. Challenging convention by pushing the boundaries of what is expected in the graphics and sound effects of online casino gaming, 2017 will see Playson add even more quality titles to its already extensive catalogue. You can learn more about Playson's other games here. Getting away from the hustle and bustle of urban living, and taking a trip into the picaresque wilderness of an untouched forest might sound delightfully idyllic. However, it is possible here, thanks to Playson, with their latest 5 reel, 20 payline online slot. 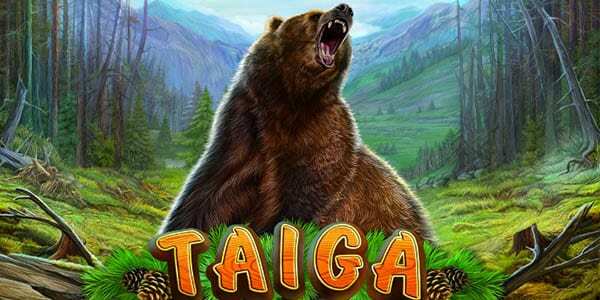 Taiga takes us into the heart of a beautiful woodland park, teeming with flora, fauna, and substantial riches! Set amidst the pleasant twitter of local birds, and with an endearing, dramatic classical soundtrack, Taiga is instant escape from hectic city life, and an opportunity to unwind by spinning the reels and finding out what nature has to offer. 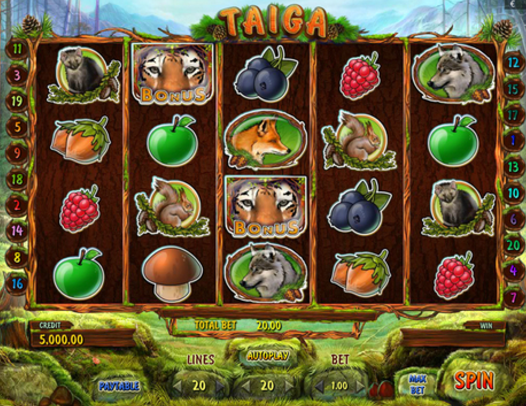 With a coin range offering a nice range of betting, starting at £0.20 and going up to £100.00, Taiga is instantly engaging with its rich variety of nature symbols and bonuses. The creature symbols range from the cute and fuzzy to the wild and wooly – with Squirrels and Stoats joined on the reels by Foxes, Wolves, and the mighty Grizzly Bear. The legendary Grizzly is the game’s highest payer – with a jackpot of 1,000x our stake coming our way when we find 3 of him on the reels. Also the Wild – in more ways than one – the Bear can substitute for all other symbols on the board, other than the Bonus symbol – the Syberian Tiger. Finding 3 of the Bonus Tiger symbols will trigger a short Free Spin round. With 5 Free Spins and a 2x multiplier throughout the bonus, this can also be extended by landing further Bonus symbols. The rest of the symbols are comprised of woodland treats – Berries, Nuts, Apples, and chunky Chestnut Mushrooms, each one dishing out smaller, regular wins. Taiga offers a nice Gamble feature, where we get to choose the higher value card, up to a winning run of 5, and this can be triggered after every win. The atmosphere created by Taiga’s pleasant, uncomplicated graphics and tuneful, peaceful audio is a relaxing one, and the short animations that occur after each win – when the animals morph from a natural, more photographic image, into a cartoon, is a nice visual touch. The regularity of the Wilds keeps these animations a regular feature, and make what is a simple, but quietly satisfying game, constantly involving. Playson have again worked hard to combine the graphical and audio elements required to make a unique gaming environment. Their woodland-themed online slot captures the playful, yet mysterious essence of the forest, and delivers a level of playability that maintains a high pace – yet seems to have a more relaxed atmosphere. 9/10 for woodland wonder from Wizard Slots.